Welcome to the first Microsoft Windows Patch Day overview of 2019. Microsoft released security updates for all supported client and server versions of the Windows operating system and other company products such as Microsoft Office on January 8, 2019. We publish a monthly overview shortly after Microsoft’s release on the second Tuesday of each month. The overview lists all released security updates with links to Microsoft Support articles, known issues, downloads, and other Patch Tuesday related information. You can check out the December 2018 Patch Day overview here. Note: As always, we recommend to back up the system before you install updates for Windows or any other program. Microsoft released security updates for all client and server versions of Windows. No critical vulnerabilities in Windows 8.1 and 7. Windows 10 version 1809 is in active distribution. Check out our guide on delaying feature updates for Windows 10 to avoid the installation. The Update Catalog lists 187 updates for January 2019. Windows 7: 15 vulnerabilities of which 15 are rated important. Windows 8.1: 18 vulnerabilities of which 18 are rated important. Windows Server 2008 R2: 15 vulnerabilities of which 15 are important. Windows Server 2012 R2: 18 vulnerabilities of which 18 are important. Windows Server 2016: 23 vulnerabilities of which 1 is critical and 22 are important. Windows Server 2019: 25 vulnerabilities of which 2 are critical and 23 are important. Starting with the January 2019 security updates, PowerShell remote endpoints cannot be configured anymore to work with non-administrator accounts. Fixes a highly exploitable issue in Windows 10 version 1803; recommended to patch as early as possible. See Zero Day Initiative and Microsoft’s guidance on the vulnerability. Fixes an issue with esentutl /p which caused the repair to result in a “mostly empty database” which is corrupt and cannot be mounted. Security updates to Internet Explorer, Windows App Platform and Frameworks, the Microsoft Scripting Engine, Windows Kernel, Windows Hyper-V, Windows MSXML, and the Microsoft JET Database Engine. Note: The updates may introduce issues with network shares. KB4483187 — Cumulative security update for Internet Explorer: December 19, 2018 — fixes a remote code execution vulnerability. Third-party applications may have difficulty authentication hotspots. After installing KB4467682, the cluster service may fail with 2245 (NERR_PasswordTooShort) if the Minimum Password Length policy is set to a value greater than 14 characters.KB4480966. Instantiation of SqlConnection can throw an exception. After installation of KB4467691, Windows may not start on “certain” Lenovo devices with less than 8 Gigabytes of RAM. After installing KB4467684, the cluster service may fail with 2245 (NERR_PasswordTooShort) if the Minimum Password Length policy is set to a value greater than 14 characters.KB4480966. After installation of the update on Windows Server 2016, Outlook instant searches may fail with “Outlook cannot perform the search”. Microsoft released non-security updates for Office in the first week of January 2019. 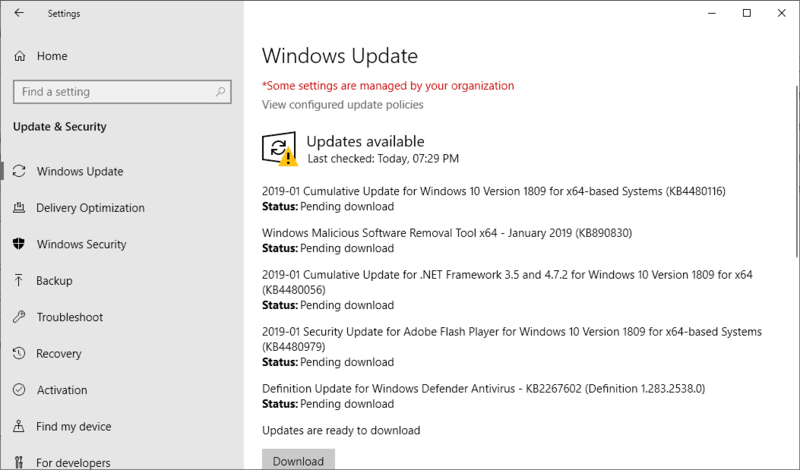 The list of security updates released in January 2019 for Office is available here. Security updates are released via Windows Update for the majority of Home systems. All Home systems are set up to check for updates automatically and download these when discovered. Activate the Start Menu, e.g. by tapping on the Windows-key. Type Windows Update and select the tool from the list of results. Activate “check for updates” to run the manual update check. Windows updates may be downloaded directly using third-party tools, e.g. Windows Update Minitool or wumgr, or Microsoft’s Download Center. Links to the January 2019 cumulative updates are posted below. Microsoft publishes all cumulative security updates and other updates on the Microsoft Update Catalog website. Direct download links are listed below. An overview of all Microsoft security updates released for all supported versions of Microsoft Windows and other company products on January 8, 2019. Notifications for future versions of SEP? I am running SEP 14.2 umanaged client and would like to know if LiveUpdate will automatically download all future upgrade patches or would I need to install those separately? Will I receive a alert or a notification from SEP that new patches or versions are released without having to check it on Symantec’s website? Email notification and Patch Stop Time? as well as is it possible to specify the stop time for patches that taking more than x amount of time to install? I saw a setting on Windows Remediation with a Terminate after field but I am unsure whether it is the correct setting that I am looking for. Who Should Install This Cumulative Update? XenServer 7.1 Cumulative Update 2 (XS71ECU2) must be installed by customers running XenServer 7.1 LTSR CU1. It includes all previously released XenServer 7.1 CU1 hotfixes. Installation of XS71ECU2 is required for all future functional hotfixes for XenServer 7.1 LTSR. XenServer 7.1 Cumulative Update 2 and its subsequent hotfixes are available only to customers on the Customer Success Services program. Citrix will continue to provide security updates to the base XenServer 7.1 CU1 product for a period of three months from the release date of the XenServer 7.1 Cumulative Update 2 (until March 12, 2019). After this three month period elapses, any new hotfixes released will only support XenServer 7.1 with CU2 applied. For more information about XenServer 7.1 CU2, see the Citrix XenServer 7.1 Cumulative Update 2 Release Notes. * Available to Enterprise Customers. This cumulative update includes the following previously released hotfixes. This cumulative update also includes additional fixes. For a list of the issues resolved by XenServer 7.1 CU2, see the Citrix XenServer 7.1 Cumulative Update 2 Release Notes. Customers should use either XenCenter or the XenServer Command Line Interface (CLI) to apply this cumulative update. When the installation is complete, see the Post-update tasks in the table Information About this Cumulative Update for information about any post-update tasks you should perform for the update to take effect. As with any software update, back up your data before applying this update. Citrix recommends updating all hosts within a pool sequentially. Upgrading of hosts should be scheduled to minimize the amount of time the pool runs in a “mixed state” where some hosts are upgraded and some are not. Running a mixed pool of updated and non-updated hosts for general operation is not supported. Note: The attachment to this article is a zip file. It contains the cumulative update update package only. Click the following link to download the source code for any modified open source components XS71ECU2-sources.iso. The source code is not necessary for cumulative update installation: it is provided to fulfill licensing obligations. Before installing this cumulative update, it is recommended that you update your version of XenCenter to the latest available version for XenServer 7.1 CU 2. The Automated Updates feature is available for XenServer Enterprise Edition customers, or to those who have access to XenServer through their XenApp/XenDesktop entitlement. For information about installing a cumulative update using the Automated Updates feature, seeApply Automated Updates. For information about installing a cumulative update using the Download update from Citrix option, see Apply an updates to a pool. Download the cumulative update to a known location on a computer that has XenCenter installed. Read the information displayed on the Before You Start page and click Next to start the wizard. Click Browse to locate the iso file, select XS71ECU2.iso and then click Open. Select the pool or hosts you wish to apply the cumulative update to, and then click Next. The Install Update wizard performs a number of update prechecks, including the space available on the hosts, to ensure that the pool is in a valid configuration state. The wizard also checks whether the hosts need to be rebooted after the update is applied and displays the result. In addition, the Install Update wizard checks whether a live patch (this is an Enterprise Edition feature) is available for the cumulative update and if the live patch can be successfully applied to the hosts. Follow the on-screen recommendations to resolve any update prechecks that have failed. If you want XenCenter to automatically resolve all failed prechecks, click Resolve All. When the prechecks have been resolved, click Next. Choose the Update Mode. Review the information displayed on the screen and select an appropriate mode. If the update contains a live patch that can be successfully applied to the hosts, it displays No action required on the Tasks to be performed screen. Note: If you click Cancel at this stage, the Install Update wizard reverts the changes and removes the update file from the host. Click Install update to proceed with the installation. The Install Update wizard shows the progress of the update, displaying the major operations that XenCenter performs while updating each host in the pool. When the update is applied, click Finish to close the wizard. If you chose to carry out the post-update tasks, do so now. Download the cumulative update file to a known location. Extract the .iso file from the zip. XenServer assigns the update file a UUID which this command prints. Note the UUID. Verify that the update was applied by using the update-list command. If the update is successful, the hosts field contains the UUIDs of the hosts to which this cumulative update was successfully applied. This should be a complete list of all hosts in the pool. If the cumulative update is applied successfully, carry out any specified post-update task on each host, starting with the master. For more information, see the XenServer 7.1 Documentation. XenServer 7.1 Cumulative Update 1 (XS71ECU1) should be installed by customers running XenServer 7.1. It includes all previously released XenServer 7.1 hotfixes. Installation of XS71ECU1 is required for all future functional hotfixes for XenServer 7.1 LTSR. XenServer 7.1 Cumulative Update 1 and its subsequent hotfixes are available only to customers on the Customer Success Services program. Citrix will continue to provide security updates to the base XenServer 7.1 product for a period of three months from the release date of the XenServer 7.1 Cumulative Update 1 (until December 11, 2017). After this three month period elapses, any new hotfixes released will only support XenServer 7.1 with CU1 applied. For more information about XenServer 7.1 CU1, see the Citrix XenServer 7.1 Cumulative Update 1 Release Notes. This cumulative update also includes additional fixes. For a list of the issues resolved by XenServer 7.1 CU1, see the Citrix XenServer 7.1 Cumulative Update 1 Release Notes. Note: The attachment to this article is a zip file. It contains the cumulative update update package only. Click the following link to download the source code for any modified open source components XS71ECU1-sources.iso. The source code is not necessary for cumulative update installation: it is provided to fulfill licensing obligations. Before installing this cumulative update, we recommend that you update your version of XenCenter to the latest available version for XenServer 7.1 CU 1. The Automated Updates feature is available for XenServer Enterprise Edition customers, or to those who have access to XenServer through their XenApp/XenDesktop entitlement. For information about installing a cumulative update using the Automated Updates feature, see the section Applying Automated Updates in the XenServer 7.1 Cumulative Update 1 Installation Guide. For information about installing a cumulative update using the Download update from Citrix option, see the section Applying an Update to a Pool in the XenServer 7.1 Cumulative Update 1 Installation Guide. Click Browse to locate the iso file, select XS71ECU1.iso and then click Open. In addition, the Install Update wizard checks whether a live patch (this is an Enterprise Edition feature) is available for the cumulative update and if the live patch can be successfully applied to the hosts. For more information, see Live Patching in XenServer in XenServer 7.1 Installation Guide. For more information see, the XenServer 7.1 Documentation. Who Should Install This Hotfix? This is a hotfix for customers running XenServer 7.1 Cumulative Update 1 with a legacy disk partition scheme. Note: This hotfix is available only to customers on the Customer Success Services program. ** Available to Enterprise Customers. If customers upgrade a host with legacy disk partition from XenServer 6.x to XenServer 7.1 CU1, and then attempt to apply a subsequent Cumulative Update as an update, they may receive an insufficient space error. This hotfix includes a fix to reduce the calculated space required to apply the update. You must apply this hotfix to XenServer 7.1 CU1 before attempting to update to a subsequent Cumulative Update. This hotfix should not be necessary on hosts that have the new host disk partition layout introduced in XenServer 7.0. When customers are attempting to use Jumbo Frames, a VM without PV drivers installed would cause the MTU to drop to 1500 as the MTU was only being set for the paravirtualised VIF device and not for the fully emulated TAP device. Customers should use either XenCenter or the XenServer Command Line Interface (CLI) to apply this hotfix. As with any software update, back up your data before applying this update. Citrix recommends updating all hosts within a pool sequentially. Upgrading of hosts should be scheduled to minimize the amount of time the pool runs in a “mixed state” where some hosts are upgraded and some are not. Running a mixed pool of updated and non-updated hosts for general operation is not supported. Note: The attachment to this article is a zip file. It contains the hotfix update package only. Click the following link to download the source code for any modified open source components XS71ECU1033-sources.iso. The source code is not necessary for hotfix installation: it is provided to fulfill licensing obligations. The Automated Updates feature is available for XenServer Enterprise Edition customers, or to those who have access to XenServer through their XenApp/XenDesktop entitlement. For information about installing a hotfix using the Automated Updates feature, see the Applying Automated Updates in the XenServer documentation. For information about installing a hotfix using the Download update from Citrix option, see Applying an Update to a Pool in the XenServer documentation. Download the hotfix to a known location on a computer that has XenCenter installed. Click Browse to locate the iso file, select XS71ECU1033.iso and then click Open. Select the pool or hosts you wish to apply the hotfix to, and then click Next. Choose the Update Mode. Review the information displayed on the screen and select an appropriate mode. Download the hotfix file to a known location. If the update is successful, the hosts field contains the UUIDs of the hosts to which this patch was successfully applied. This should be a complete list of all hosts in the pool. For more information, see XenServer Documentation. This is a hotfix for customers running XenServer 7.1 Cumulative Update 1. All customers who are affected by the issues described in CTX239432 – Citrix XenServer Multiple Security Updates should install this hotfix. This security hotfix addresses the vulnerabilities as described in the Security Bulletin above. Note: The attachment to this article is a zip file. It contains the hotfix update package only. Click the following link to download the source code for any modified open source components XS71ECU1032-sources.iso. The source code is not necessary for hotfix installation: it is provided to fulfill licensing obligations. Click Browse to locate the iso file, select XS71ECU1032.iso and then click Open. If the hotfix is applied successfully, restart each host in the pool, starting with the master. This is a hotfix for customers running XenServer 7.5. Note: The attachment to this article is a zip file. It contains the hotfix update package only. Click the following link to download the source code for any modified open source components XS75E007-sources.iso. The source code is not necessary for hotfix installation: it is provided to fulfill licensing obligations. Click Browse to locate the iso file, select XS75E007.iso and then click Open. This is a hotfix for customers running XenServer 7.6. Note: The attachment to this article is a zip file. It contains the hotfix update package only. Click the following link to download the source code for any modified open source components XS76E002-sources.iso. The source code is not necessary for hotfix installation: it is provided to fulfill licensing obligations. The Automated Updates feature is available for XenServer Enterprise Edition customers, or to those who have access to XenServer through their Citrix Virtual Apps and Desktops entitlement. For information about installing a hotfix using the Automated Updates feature, see the Applying Automated Updates in the XenServer documentation. Click Browse to locate the iso file, select XS76E002.iso and then click Open. An incorrect setting in the I/O scheduler for all blktap devices can cause poor I/O performance in certain scenarios, depending on the server hardware, server configuration, VM configuration, and workload. This hotfix includes the correct setting. Due to incorrect maximum sector size used by Dom0 kernel, users failed to copy VDIs to/from SR targets on certain iSCSI disks. For XenServer pools that use certain storage targets, a race condition in the iSCSI module can cause hosts in the pool to crash. It is not possible to attach storage provided by iSCSI target Server on Windows Server 2016 VMs. Note: The attachment to this article is a zip file. It contains the hotfix update package only. Click the following link to download the source code for any modified open source components XS71ECU1030-sources.iso. The source code is not necessary for hotfix installation: it is provided to fulfill licensing obligations. Click Browse to locate the iso file, select XS71ECU1030.iso and then click Open.